What happens when online fashion retail meets deal aggregation? FashiModo.dk. Trendsonline reports that this new Danish startup leads the way to the best fashion finds online in one place, so shopping can be done in minutes instead of several hours. The site is also for shoppers looking for a good deal, with already nearly 6,000 deals on the side, and Philip Andersen explains you can save, on average, around 40% of the price. Fashimodo.dk is quick and easy to navigate because a lot has been done so that page to work best whether you visit it via smartphone, tablet or computer. 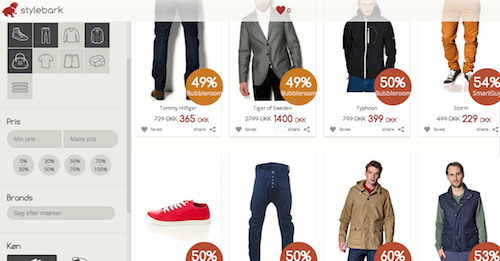 “We have primarily focused on the Fashimodo.dk should be easy and quick to use. Therefore, we have been focusing on making the site suitable for mobile platforms so that women can check out the best deals when they have the time for it,” explains Philip Andersen. Already Fashimodo.dk fully functional, but the plan is that the site is continuously optimized and adapted to customer needs and requirements. This venture is Andersen‘s latest ‘small hobby project’, that comes out of his learning-by-doing mentality, as his first project working with Ruby on Rails. We look forward to seeing more ideas grow! Update: got feedback that it was 6,000 deals, and not 4,000 deals as we wrote in the original article!